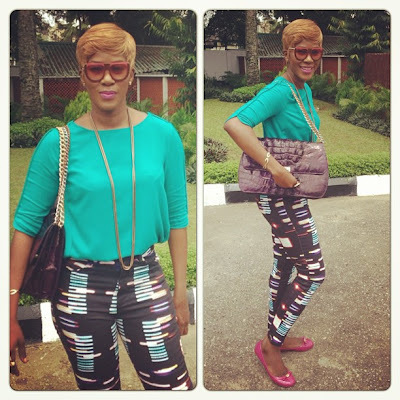 Weeks after changing her signature long-hair look to blonde, Stephanie Okereke is still rocking her short blonde look. Apart from acting, Stephanie would make a great model. U look soooooo cute lol!!! I like you a lot but stop doing this Tonto Dike colour riot please. which one is blonde hair, blueish green top, multi colour pant and rose bag and pink shoe. Abegiii, finr that your classy dressing like before. There is noffin cute abt ur new look if u ask me.ur former look best suit ur figure….u shld jst stop trying to b someone else.d former u is jst so UNIQUE! No need to HATE!!!! !There nothing like colour riot here,she’s blended the colur well. You look good but you should stop bleaching. you are getting more whiter than your formal colour, look at your hand and face they are more fair than your leggs. Please stop it now.